The All-Ukrainian Festival-Contest “Gifted Youth – 2019” will be held. 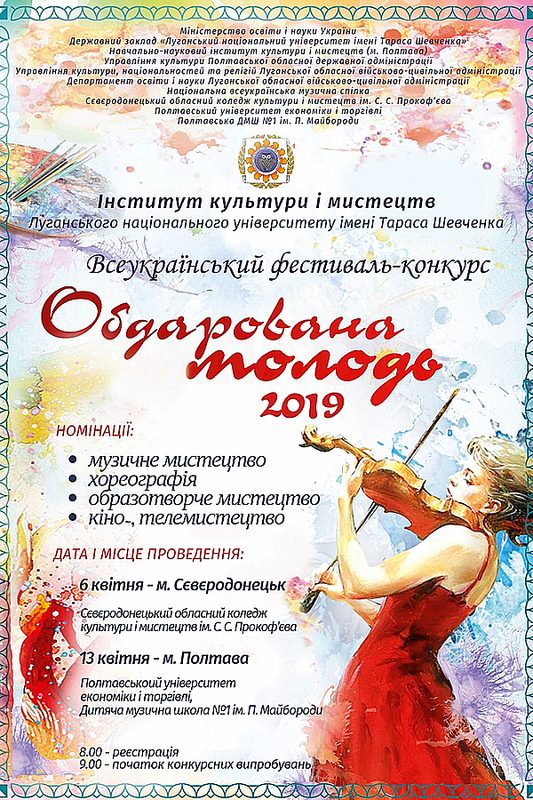 April 6, 2019 (the city of Severodonetsk) only participants in the nominations of the “Musical Arts” direction are invited to participate in the Festival-Contest; the Festival-Contest will be held at the premises of the Severodonetsk Regional College of Culture and Arts named after S.S. Prokofiev (10 Khimikov Avenue, the city of Severodonetsk). April 13, 2019 (Poltava) participants of all directions are invited to the participation; the Festival-Contest will be held in the premises of Poltava University of Economics and Trade (3 Koval Str., the city of Poltava) and Music School No. 1 named after P. Maiboroda (35 Sretenska Str., the city of Poltava). Registration of participants – from 8.00, competitive tests – from 9.00. Applications and documents necessary for participation in the Festival-Contest are submitted until March 25, 2019 (inclusive) by e-mail of the organizing committee “direktorat_ikm@ukr.net” or are provided personally at the address of the organizing committee: 3 Koval Str., the city of Poltava, directorate of the Institute of Culture and Arts, LTSNU, room 400, room 233 (in the premises of the Poltava University of Economics and Trade). Requirements for registration and submission of the application and the necessary documents for participation in the Festival-Contest are in the Appendix. The Festival-Contest will be held at the expense of a charitable contribution. Charitable contribution is used to cover the costs of organizing and holding the Festival-Contest. Details of the charitable contribution account: purpose of payment ̶ “Charitable contribution”; Recipient – Primary Trade Union Organization of Luhansk Taras Shevchenko National University; Recipient identification code: 21789523; No p / p.: 26009053728771; MFO 304795; account is opened in PrivatBank. Contact phone numbers of the organizing committee: coordinators of the Festival-Contest on organizational issues – Nelya Vyacheslavivna Nazarenko (066-064-93-69), Kateryna Serhiivna Palii (097-626-41-58); curators on issues of competitive requirements in the areas of the Festival-Contest: Musical arts – Inna Olegivna Stashevska (050-242-08-26); Choreography – Liudmyla Mikhailivna Sokil (066-494-86-50); Fine Arts – Inna Anatoliivna Gurzhii (066-274-49-31); Cinema-, TV-arts – Tetiana Volodymyrivna Shelupakhina ( 099-701-95-08). The Festival-Contest will take place in two rounds. In the second round, the laureates of the I degree compete for the Grand Prix in each nomination. Winners will be awarded diplomas of the laureate of I, II, III degree or the diploma. Other participants will receive a certificate for participation.